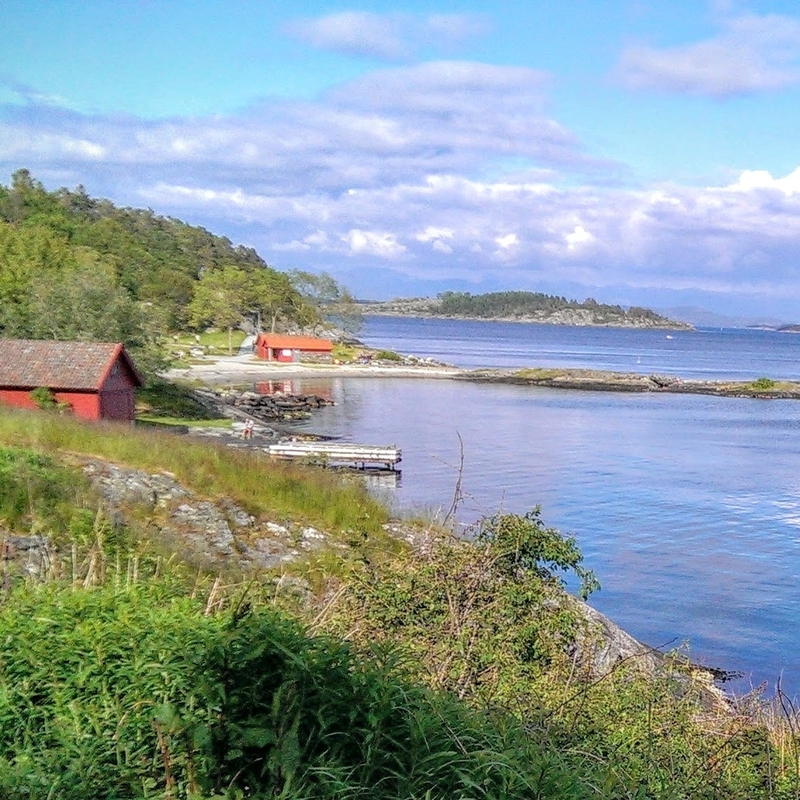 The only way to get to Flørli, a hamlet in Lysefjord is by ferry. From Stavanger, the direct ferry goes three times a week and I was on one of them as I was to join a small group of people from different parts of Europe on a week-long volunteering project. After an hour or so of being awestruck by the fjords, the ferry came to a halt in front of a small dock where a family with expectant faces seemed to be awaiting the arrival of someone. When a teenager got off, we assumed that she was the guest of honour but everyone greeted a small-ugly-dog that was accompanying the girl instead. As all the passengers of the ferry looked on at this odd reunion at the banks of the Lysefjord, it was clear that we were going somewhere remote. That evening, I was in charge of cooking dinner. There were no shops in Flørli and our supplies for the week were arriving the next day. I was unfazed. After over seven years of living alone and some occasional trips to People’s Kitchen (a voluntary project in London where volunteers collect surplus food from shops and everyone comes together to cook up a feast), I am getting closer to mastering the art of creating a meal from anything in the fridge or the cupboard. I looked through the cupboard to see what we had – two cans of chickpeas, a bag of potatoes, half a bag of rice, cans of tomatoes, varied spices. It was a simple dinner but we were hungry and full of energy for the week lying ahead and I like to think we enjoyed my random meal. Sitting around the table in our apartment on top of a hill facing the fjords, we assessed each other – a group of five young people – two boys (one Polish, one British), three girls (one Polish, one Russian living in Prague, and one Indian living in London). The youngest among us was 18 and it was fascinating to listen to his perspective and questions about life. Our project leader, Hessel (Dutch, living in Norway for some years), who was one of the only two long-term residents of the hamlet, announced that the Grand Plan was to transform a school building into a school pub to add more appeal to the area for visitors. We discovered that this wasn’t as non-charitable as it sounded because there were no children in Flørli and the inhabitants of the hamlet, an artist (67) and Hessel (37) didn’t need to avail the services of a school any more. Hessel told us that he had planned an opening of the pub in six days, the end of our volunteering week. This seemed over ambitious because when we saw the building, the paint was peeling off, the windows were gone or non-existent, the roof was falling apart, and the inside was a total mess. But despite all this, I noticed that we all called what seemed to be an old building in severe disrepair, the ‘school pub’, in all manner of optimism. We had to learn the varied skills of a handyman/construction worker and learn them fast. Hessel helped us do this with his eternal cheerfulness and patience. Over the next few days we came to appreciate the challenges of renovating an old building, the travails of a construction worker, and how dependent we all really are on nature. I learnt how to use a high pressure jet to wash the outside of the school-pub and later learnt how important this task was because it helped remove the algae and other dirt from the walls to facilitate painting. A scaffolding was constructed and stood shaking in the strong winds to the backdrop of the fjords. Whether it was raining or not was irrelevant. We stood in the wind or the rain and scraped windows. The boys had to balance themselves on the scaffolding and fit planks of wood on the roof so that it would be strong. The windows needed putty so that the glass stayed in place. One day, Hessel discovered that he had the wrong paint colour so he had to take the ferry to Stavanger to buy some red paint. We were out of our natural city- computer-dependant-jobs/studies, and felt a bit lost in this construction world in the middle of the fjords. We tried to do what we thought was best, but it was a slow morning. When Hessel finally arrived, we greeted him as if he was family. He brought with him some new cans of bright red paint and that meant we could start painting! There was balancing on ladders, climbing up the scaffolding, using long sticks with brushes and different methods applied to reach difficult corners. We realized how hard it was to paint a whole structure. This hard work was interspersed by several varied adventures every evening, cooking and enjoying spectacular meals, listening to all genres of music and having open conversations about everything. One evening, we took a boat out into the fjords on a seal safari, everyone skipping with joy and laughing at everything. Another day, we went to climb the 4,444 steps to the old hydropower in Flørli. We had been working the whole day and it was a hard climb as the stairs were narrow and made out of wood. But the fact that it was well past 10 PM and the sun was yet to set made us appreciate the views of the fjord on either side even more. We returned around half past two in the morning and it still wasn’t completely dark; there were goats with bells walking around outside the apartment-house and we fell asleep to the sound of their bells. There were more hikes with grassy paths, solitary huts on the top, a suspension bridge on a waterfall and rings of snow clad mountains. On our last day in Flørli, we took a ferry to Forsand and were picked up by a Norwegian taxi driver, an ‘acquaintance’ of Hessel, who took us to Preikestolen, the famed hiking spot. There was a dog in a cage in the ‘taxi’ and the man had several scars and a strong Texan drawl. It could have been a ride out of a Coen movie. But thankfully, we all survived. It was raining the whole day and when we reached the top of Preikestolen, we didn’t have much of a view, but we enjoyed it all the same. Our ferry back to Flørli had the same golden haired ferry boy that we had seen a few times on our ferry-travel. He didn’t seem to do much but check or issue people tickets and hop from ferry to ferry and hence fjord to fjord. A wholly entertaining imagination about his life led to much laughter and joy. That evening after our return to Flørli and a warm-hearted dinner – I was pleased that I managed to make an apple tart of sorts which I was told tasted like autumn by some and winter by others – we went down to take a look at our glorious school pub. And boy, was it glorious. The last week’s activities finally came together and every menial or non-menial job made sense. Our efforts of painting the outside bright red made the school pub look inviting and ready for a party. The insides were spotless and bright. Large maps of Norway were on the walls. The scraped and well-fit windows provided shelter to the warm insides of the pub. The planks of wood on the roof seemed to hold it all up together. We were proud of our work and our contribution to the creation of a new meeting space that will hopefully trigger much Norwegian+international banter and laughter. The melancholy of our departure from Flørli was slightly dispelled by the appearance of the fabulous s-f-b, shiny ferry boy who sent us into a flurry of giggles when he asked us if we were all going back to Stavanger. As we explored Stavanger and slowly parted ways, I felt like I was returning to my ‘normal self’ again – travelling solitary through exploration of the culture and ways of working of a place by going to museums, reading, writing, going for rambles in the suburbs and taking public transit to new places. But wherever new I went, I seemed to spot a scaffolding or someone painting the roof or scraping their windows.I realized that a new perspective of the world had been awakened (yet again). After a few days of going back to our respective lives, there was a round of e-mail exchanges filled with goodwill. It was apparent that our lives were very different from each other. But something else was apparent too – the richness of our experiences shared while we painted the roofs and reconstructed a school pub in the heart of the Norwegian fjords using a shaky scaffolding as support, reminded us of other sources of happiness. Working in the rain, listening to the sounds of the fjords, planning and executing spontaneous adventures with new friends, cooking and eating meals together, having humour for daily life – this trip, was much more than just about the scaffolding.